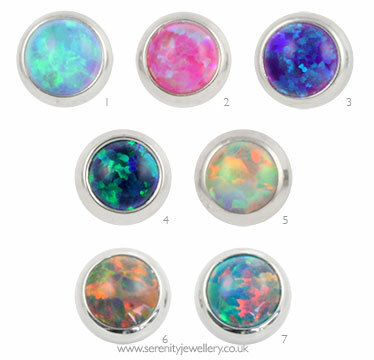 Industrial Strength* hypoallergenic titanium flat back screw-in 2.8mm faux-pal cabochons in 3.5mm settings (Industrial Strength size 3mm). PLEASE NOTE this item is the screw-in top only not a complete labret. 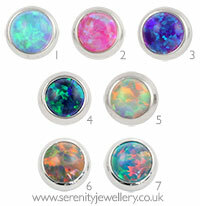 These cabochons can be used with Industrial Strength titanium labret posts but will not fit any other brand. Can be fiddly to screw into the posts but once in can just be left be until you fancy a change. Got the teal ones and picture is a good representation of actual colour. Very happy customer. High quality and a reaaaaally beautiful color: purple with pink or teal sparkles depending on the light. Only 4 stars because they're a bit tricky to screw in... I would not change them everyday, but will definitely buy other colors someday. Beautiful high quality earrings. Much smaller than I had anticipated. I really like this item, I think it looks exactly like the picture on the website and I think it's also really good that you can select the size of the earring to suit your liking. You just have to remember to purchase the bar to go with it! I bought the Sleepy Lavender colour in 3mm for my tragus and it's beautiful. Lovely blue which sparkles purple/pink in the light. Another happy purchase from Serenity Beauty! Very nice, you can see the quality in the Industrial Strength items.